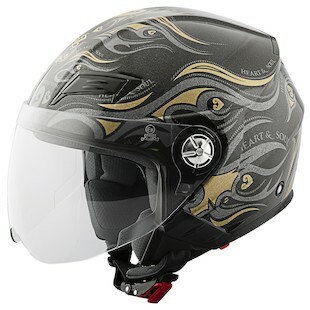 The SS650 is a new entry to Speed and Strength’s three-quarter helmet line up. It has the modern technical look of the SS2200 at a price point that is more akin to the classic looking SS700. It accomplishes this feat by using the same shell construction method of the SS700 only now with a new engineered blend of thermoplastics for 2014. 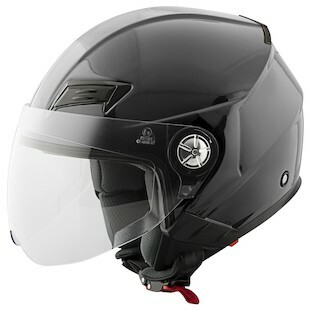 The Speed & Strength SS650 borrows more than just good looks from the SS2200; it is packed with many higher end features like a moisture wicking liner and a flip down sun visor. The SS650 is best suited for the sport touring or commuter crowd that needs a helmet to perform in warmer climates. The shell of the SS650 is sculpted for aerodynamics and ventilation. There are two intake ducts to pull cool air through the top of the helmet, then two corresponding exhausts for venting out the heated air. The intake ducts can be closed off to enable this to be a true multi-season helmet. Another higher-end feature is the ratcheting Speed Strap. This allows easy on, easy off closure without having to fuss with D rings that are normally found at this price point. If you are looking for a technical three-quarter helmet at an entry-level price point, look no further than the SS650. The new for 2014 SS650 helmet is also available in a new graphics package called The Speed & Strength SS650 Heart and Soul. It has a light metallic gold frosting over a black base coat. The frosting is more subtle than a metal flake and parlays well to the gold and silver graphics. The S&S branding is subtle, only a small script across the front crown and at the lower rear above the DOT designation. The stylized graphics seem to take an Art Nouveau approach to a modern tribal pattern, so it almost has a retro feel to it. What do you think?